One of Ansel Adams iconic images was taken here, intead of trying to duplicate his photograph, I did something completely different with the place. Here are my field notes, this was taken at very end of twilight. The trees were lit with a head lamp during a 30 sec exposure. I left my intervolometer/cable relase at home so 30 secs for every shot with the self timer was getting to me. It’s the moon around 9pm taken over an hour past sunset. 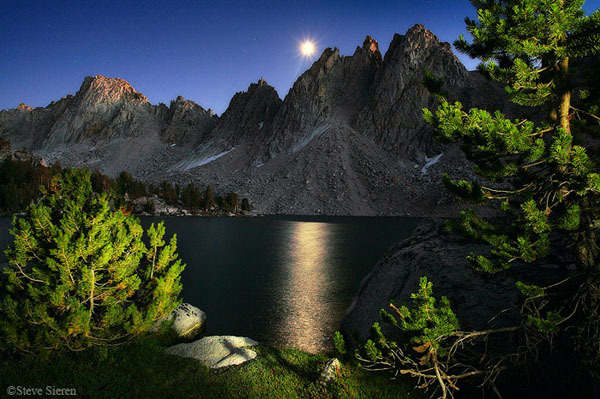 The moon isn’t close to setting yet but the peaks around 11,900 ft elevation and the lake is at around 10,900ft so it actually not setting until about midnight. The intervolometer is a just a cable release w/ some timer funtions on it. The device is made by Canon and is no better then a cheap calculator watch. It’s a good tool to have in case your sleepy and forget that you left your DSLR on bulb all night long. After backpacking the 8.5 miles to get here and missing sunset I felt the need create something. I gave it a touch of the orton effect (learned from Marc Muench) to give it just a touch of dreaminess. After reading Richard Wong’s In the Field blog last week I thought I would share my thoughts and a few experiences on light painting. Light painting brings out some of the best traits a photography can carry, creativity, visualization and enjoyment. The easier the idea the easier the execution can be. I’ve been told by other biasd photographers that there are only certain ways of light painting, I find that idea too limiting and it only steals all the fun out of it! I’ve even seen some of these light painting biasd photographer change their mind and now teach it as well. Some of these shared limiting beliefs are only use LED lights, the stars must be a certain way, and you must only use a single exposure. In light painting you become the only source of light besides the stars and moon if it’s out there. When you get an idea and begin to wonder how much “fun” it could be putting the idea together, there shouldn’t be anything that limits you. 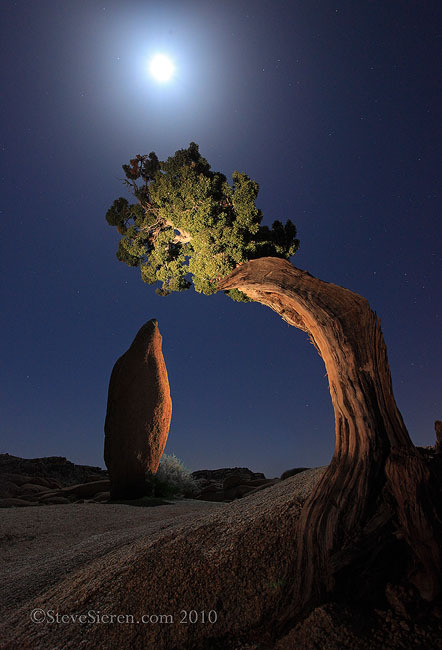 Lone Juniper Tree & Balanced Rock in Joshua Tree National Park. With help from a friend I was able to capture this scene in one exposure, otherwise I would of had to of used an intervolumeter(programable cable release). Shared image location on a google map. This entry was posted on October 6, 2011 at 10:10 am and is filed under Uncategorized. You can follow any responses to this entry through the RSS 2.0 feed. You can leave a response, or trackback from your own site. Cool shots, Steve. I especially like the second one. Light painting definitely offers huge possibilities for new creativity! I believe in light painting. Photographers capture light. I like your way of doing it. Very tasteful. Thank you Dan & Matt. The bigger the scene gets the harder it is to capture it in an appealing way. After seeing some of your images at your presentation to the Los Angeles Sierra Club Camera Club, I have become a big fan of yours. Your great images are awesome projected on a big screen. The ones where you used light painting are wonderful!!! I recall you used various light sources. Thank you for sharing info. I love how clean and simple/uncluttered the second photo is. What’s great to look at is how you did the light painting on the rock, creating a light and unlighted section. On the first photo I keep focusing on the light (from the moon) on the peaks of the mountain. Pretty cool.